Polyostotic fibrous dysplasia can occur as a part of McCune-Albright syndrome (unilateral polyostotic fibrous dysplasia, ipsilateral café-au-lait spots on the skin, and endocrine disturbances such as precocious puberty) or Mazabraud syndrome (polyostotic fibrous dysplasia and soft-tissue myxomas). Fibrous dysplasia has also been reported in association with other endocrine dysfunctions,  such as hyperthyroidism, hyperparathyroidism, acromegaly, diabetes mellitus, and Cushing syndrome. The image below depicts distinctive pigmentation that can be seen in patients with fibrous dysplasia and endocrine abnormalities. Note that the border of the lesion is jagged and irregular. Clinical photograph shows the distinctive pigmentation in patients with endocrine abnormalities associated with fibrous dysplasia. Go to Fibrous Dysplasia Imaging for complete information on this topic. Fibrous dysplasia represents about 5% of benign bone lesions  ; however, the true incidence is unknown, as many patients are asymptomatic. Monostotic fibrous dysplasia accounts for 75-80% of the cases. Endocrine disturbances may be the initial presentation in some patients. This section will briefly review the common affected locations of fibrous dysplasia, fibrous dysplasia deformity and fracture, and malignant transformation for this lesion. The most common sites of skeletal involvement in monostotic fibrous dysplasia are the ribs, proximal femur, and craniofacial bones, typically the posterior maxilla. [4, 5] The lesion may involve only a small segment of bone or it may occupy its entire length. In polyostotic fibrous dysplasia, the spectrum of involvement varies from 2 bones to more than 75% of the skeleton. Polyostotic fibrous dysplasia is most commonly found in the femur, tibia, pelvis, and foot. Other sites less commonly affected include the ribs, skull, and bones of the upper extremity. Uncommonly affected bones include the lumbar spine, clavicle, and the cervical spine. The most common physical deformities are leg-length discrepancy, facial asymmetry due to hemicranial involvement, and rib deformities. Malignant transformation of fibrous dysplasia occurs very infrequently, with reported prevalences ranging from 0.4% to 4%. Previous irradiation has been documented in more than half of the cases with malignant transformation. The most common malignant tumors are osteosarcoma, fibrosarcoma, and chondrosarcoma, and the majority of patients are older than thirty years when the sarcoma is diagnosed. The craniofacial region is the most common site of involvement, followed by the femur, tibia, and pelvis. The rate of malignant transformation is higher for polyostotic lesions than for monostotic lesions. On plain films, fibrous dysplasia is an intramedullary, expansile, and well-defined lesion in the diaphysis or metaphysis. The lesions can vary from completely radiolucent to completely sclerotic; however, most lesions have a characteristic hazy ground-glass appearance (see the following images). The degree of haziness shown radiographically by a given lesion correlates directly with its underlying histopathology. More radiolucent lesions are composed of predominantly fibrous elements, whereas more radiopaque lesions contain a greater proportion of woven bone. 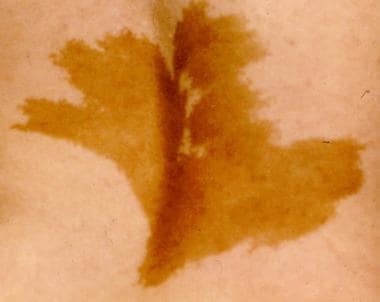 Plain film shows a lytic lesion of the femoral neck with surrounding sclerosis and a hazy or "ground glass" appearance. Plain film of a larger lesion of the femoral neck than in the previous image demonstrates the physical distortion that can accompany fibrous dysplasia. Endosteal scalloping of the overlying cortex may also be seen. In addition, the lesion may be surrounded by a layer of thick, sclerotic reactive bone termed a "rind." Repeated fractures through lesions in the proximal femur can result in a varus angulation called a "shepherd's crook deformity." At the patient's initial presentation, scintigraphy may be used to demonstrate the extent of disease. Active fibrous dysplasia lesions in younger patients have greatly increased isotope uptake; the uptake becomes less intense as the lesions mature. The extent of the lesion is best demonstrated on computed tomography (CT) scans. This imaging modality is helpful in distinguishing fibrous dysplasia from other lesions in the differential diagnosis. Magnetic resonance imaging (MRI) is a sensitive means of establishing the lesion's shape and content. Because fibrous dysplasia is composed mainly of fibrous tissue and bone, T1-weighted images have a low-intensity signal. T2-weighted images have a higher intensity signal that is not as bright as the signal of malignant tissue, fat, or fluid. Incidentally discovered, asymptomatic, radiographically characteristic fibrous dysplasia lesions do not require further assessment and require only clinical observation. Follow-up radiographs every 6 months to look for progression has been recommended. In newly identified cases, a bone scan is needed to exclude a diagnosis of polyostotic disease. When polyostotic disease is found, referral to an endocrinologist for early detection of possible systemic abnormalities is warranted. Treatment of malignant transformation is based on the subtype of sarcoma, but the prognosis tends to be worse for patients with malignant transformation than it is for those with a similar primary sarcoma not associated with fibrous dysplasia. The macroscopic appearance of fibrous dysplasia is that of a centrally located, tan to gray white, gritty-feeling lesion (see the image below). Areas of cyst formation or hemorrhage may be identified. The lesion can be easily peeled away from the encircling shell of reactive bone by blunt dissection. Occasionally, small islands of cartilage that undergo calcification and enchondral ossification may be observed in the lesional tissue. 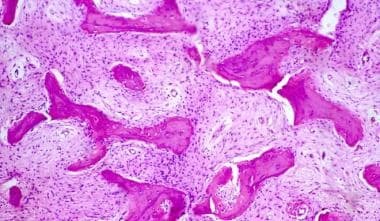 This phenomenon is most frequently encountered in the proximal femur and is sometimes referred to as fibrocartilaginous dysplasia. 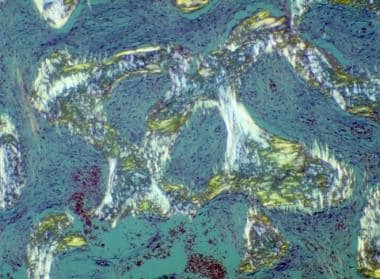 Photomicrograph of fibrous dysplasia demonstrates irregularly shaped islands of woven bone with a bland mononuclear background stroma. Medium-power view of a microscopic field of fibrous dysplasia. The segments of bone demonstrate an intensely pink osseous matrix that is part of the woven bone formation process. Low-power photomicrograph of a more mature lesion than in the previous image demonstrating maturation and coalescence of the woven bone. There is a more noticeable hyalinization of the stroma that can be seen in older lesions. Inflammation can also be noted. Examination of fields of fibrous dysplasia with polarized light demonstrates the woven nature of the collagen deposition characteristic of this tumor. Multiple, delicate capillaries are found throughout the lesion and, when injured, incite a giant-cell reactive process. 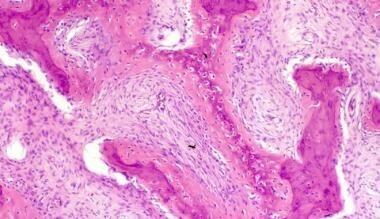 A cartilagenous component, composed of lobules of mature hyaline cartilage (fibrocartilaginous dysplasia), may be encountered, most often in the proximal femur. Hemorrhage and cystic change may be occasionally found. Secondary aneurysmal bone cyst formation can also occur. Fibrous dysplasia is caused by a somatic mutation in the GNAS1 gene located on chromosome 20q13.2-13.3, which encodes the alpha subunit of the stimulatory G protein, Gsα. As a consequence of this mutation, there is a substitution of amino acid arginine in position 201 (R201) of the genomic DNA in the osteoblastic cells, by amino acid cysteine (R201C) or histidine (R201H). The abnormal G1 protein stimulates cyclic adenosine monophosphate (AMP), and the osteoblastic cells expressing this mutation have a higher rate of DNA synthesis than normal cells. 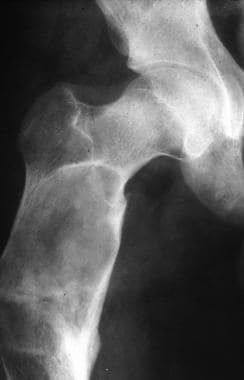 This abnormal growth leads to the formation of a disorganized fibrotic bone matrix with primitive bone formation, and lack of maturation to lamellar bone. Mineralization is also abnormal. There is a failure of the bone to align in response to mechanical stress. This defect is seen in the monostotic as well as the polyostotic forms of fibrous dysplasia. The extent of disease is related to the stage at which the postzygotic mutation in Gsα has occurred, whether during embryonic development or postnatally. The recurrence rate of fibrous dysplasia after curettage and bone grafting is high. However, the majority of the monostotic lesions stabilize with skeletal maturity. As a rule, the monostotic form does not convert to the polyostotic form. Although the manifestations of the polyostotic form may be severe, it does not proliferate and generally becomes quiescent at puberty. However, the existing deformities may progress. Eisenberg RL. Bubbly lesions of bone. AJR Am J Roentgenol. 2009 Aug. 193(2):W79-94. [Medline]. Riminucci M, Saggio I, Robey PG, Bianco P. Fibrous dysplasia as a stem cell disease. J Bone Miner Res. 2006 Dec. 21 Suppl 2:P125-31. [Medline]. Parekh SG, Donthineni-Rao R, Ricchetti E, Lackman RD. Fibrous dysplasia. J Am Acad Orthop Surg. 2004 Sep-Oct. 12(5):305-13. [Medline]. Godse AS, Shrotriya SP, Vaid NS. Fibrous dysplasia of the maxilla. J Pediatr Surg. 2009 Apr. 44(4):849-51. [Medline]. Rahman AM, Madge SN, Billing K, Anderson PJ, Leibovitch I, Selva D, et al. Craniofacial fibrous dysplasia: clinical characteristics and long-term outcomes. Eye (Lond). 2009 Dec. 23(12):2175-81. [Medline]. Shah ZK, Peh WC, Koh WL, Shek TW. Magnetic resonance imaging appearances of fibrous dysplasia. Br J Radiol. 2005 Dec. 78(936):1104-15. [Medline]. Wootton-Gorges SL. MR imaging of primary bone tumors and tumor-like conditions in children. Magn Reson Imaging Clin N Am. 2009 Aug. 17(3):469-87, vi. [Medline]. Saglik Y, Atalar H, Yildiz Y, Basarir K, Erekul S. Management of fibrous dysplasia. A report on 36 cases. Acta Orthop Belg. 2007 Feb. 73(1):96-101. [Medline]. Kusano T, Hirabayashi S, Eguchi T, Sugawara Y. Treatment strategies for fibrous dysplasia. J Craniofac Surg. 2009 May. 20(3):768-70. [Medline]. Nelson BL, Thompson LD. 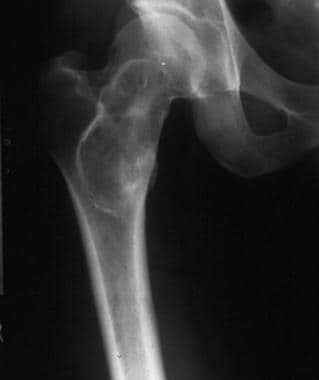 Fibrous dysplasia of bone. Ear Nose Throat J. 2003 Apr. 82(4):259. [Medline]. Kahn MA, Lucca M, Papageorge MB. 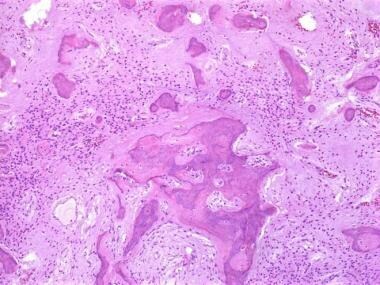 A clinico-pathologic correlation: fibrous dysplasia. J Mass Dent Soc. 2006 Winter. 54(4):48-50. [Medline]. Riminucci M, Robey PG, Bianco P. The pathology of fibrous dysplasia and the McCune-Albright syndrome. Pediatr Endocrinol Rev. 2007 Aug. 4 Suppl 4:401-11. [Medline]. Lietman SA, Schwindinger WF, Levine MA. Genetic and molecular aspects of McCune-Albright syndrome. Pediatr Endocrinol Rev. 2007 Aug. 4 Suppl 4:380-5. [Medline]. Lee SE, Lee EH, Park H, Sung JY, Lee HW, Kang SY, et al. The diagnostic utility of the GNAS mutation in patients with fibrous dysplasia: meta-analysis of 168 sporadic cases. Hum Pathol. 2012 Jan 14. [Medline]. Tabareau-Delalande F, Collin C, Gomez-Brouchet A, Decouvelaere AV, Bouvier C, Larousserie F, et al. Diagnostic value of investigating GNAS mutations in fibro-osseous lesions: a retrospective study of 91 cases of fibrous dysplasia and 40 other fibro-osseous lesions. Mod Pathol. 2013 Jul. 26(7):911-21. [Medline]. Tabrizi R, Ozkan BT. Craniofacial fibrous dysplasia of orbit. J Craniofac Surg. 2008 Nov. 19(6):1532-7. [Medline].